A young autistic woman with limited vision and hearing has begun to thrive with the help of equine therapy with a miniature donkey. Emily, 23, has struck up a special friendship with Juniper at The Donkey Sanctuary in Britain. The donkey has helped her to better connect with the world around her. Emily had a particularly difficult year in 2017, after badly injuring her leg in an accident. Confined to a wheelchair while her leg was healing, she became withdrawn and frustrated, and found it difficult to understand what was going on. When she first attended The Donkey Sanctuary to take part in the therapy sessions, Emily wasn’t interested and was incredibly anxious. 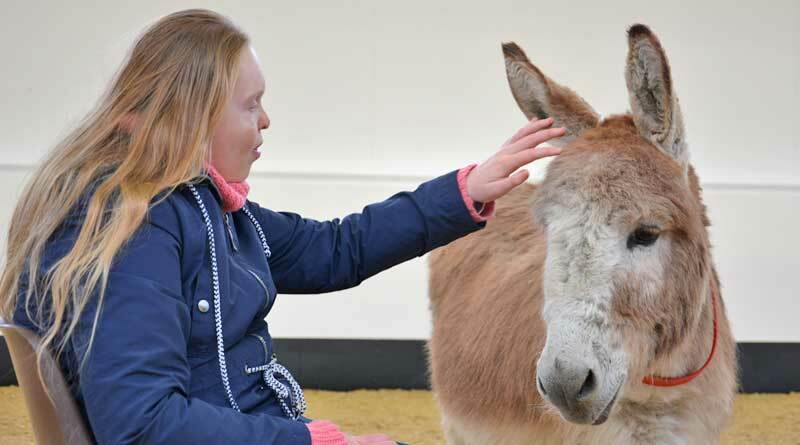 “The staff and donkeys were patient and understanding, and gradually Emily started to feel more positive and engaged with the activities,” Emily’s mum, Melissa, said. Her sessions with Juniper helped her to relax, and she enjoyed being by his side touching his coat and brushing his tail. His presence alone was calming and Emily seemed to mirror this. After her accident, when she needed to build up her strength and confidence, Juniper helped her recovery as she was motivated to walk with him around the arena. Emily now has a special bond and friendship with Juniper. Emily giggles and talks to him, always saying ‘goodbye Juniper’ at the end of the session. Melissa says that this has really helped with Emily’s communication and she now even interacts with her pet dogs at home, whereas before she wouldn’t. The director of donkey-assisted therapy at The Donkey Sanctuary, Caron Whaley, says donkeys, as social creatures, are very aware of their environment and the people within it. Juniper benefits from time spent with Emily and their interaction too. It keeps him active and enriches his life by stimulating his mind. During the sessions Juniper has a free rein and it is his choice to approach Emily and spend time with her, or to move away if he wishes. When Juniper is with Emily, he shows signs of relaxation and curiosity. Like all donkeys, Juniper is very intelligent, and the mental stimulation which comes with interacting with new people and new experiences makes his life more enriching. The gentle movement that Juniper undertakes in these sessions also helps him physically as he has mild arthritis, which is managed with medication, but helped by keeping him active. The Donkey Sanctuary has six centres around Britain offering donkey-facilitated learning sessions. The sessions use a calm and mindful approach to bring people and donkeys together, and provide opportunities for emotional connection, social interaction, communication and confidence building.